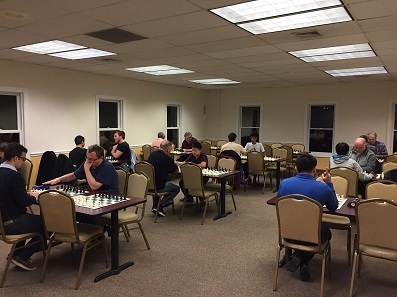 Our end of the year blitz tournament drew 19 players, including five masters and one international player. CCFC’s own NM Arslan Otchiyev and NM Ian Harris were the two favorites going into the tournament. 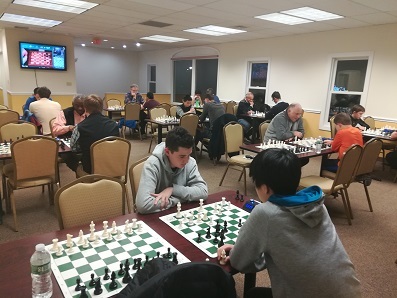 Otchiyev and Harris met in just the third round of the 8 game blitz tournament. Harris gained an early advantage, but Otchiyev defended tenaciously and turned the game around to win. Meanwhile, FM Yoon-Young Kim kept pace with Otchiyev. After their fourth round draw, Otchiyev was held to a pair of draws while Kim was simply unstoppable, winning his final four games. With a final undefeated score of 7.5/8, the winner of the tournament and the $41 first prize was FM Yoon-Young Kim! Meanwhile, the fight for the U1900 prize was also hotly contested. Slawomir Naumowicz and Leo Byhkovsky played in the final round deciding game. In the end, Naumowicz won the game to clinch the $41 top U1900 prize to himself with a final score of 5/8! Three players tied for the top U1600 prize. The co-winners were Cayden Yang, Julian Wang and Aurelius Mlynar. Each scored 4.5/8. Caydan Yang had perhaps the best tournament of any player in the field. He played four of the five masters in the tournament, defeating one and drawing the top seeded Otchiyev! Congratulations to all of the winners and thank you to everyone that made it out to participate!